Description: A pure white tea from the green hills of Goomtee which looks fresh in its greenery hue along with fine silvery tips which adds to the aesthetic beauty of the tea leaves along with promises of amazing taste and freshness. This special tea was specially plucked with extra care and only the bud and the two leaves were used to make this tea, hand rolled with minimal processing, left in its natural state. The plucking and sorting is done excellently as is noted from the infused leaves which are fuller and have deliciously fresh aroma. This particular lot was plucked and manufactured during evening time when the tea buds and leaf had fully absorbed the days sunlight and hence has more health benefits and adds a bit more deliciousness to it. Since the tea leaves belong to a special section of this tea garden, which was pruned the previous year and is the first fresh pluckings for the year, the leaves are more juicy and contain more polyphenols, more flavonoids and are high in anti - oxidants compared to the other white teas. In short, this is the purest form of white tea one can ever have. The liquor color is transparent to that having a feeble greenish hue. It taste sweet and has subtle floral taste coupled with pleasing complex tastes and leaves a heavenly mouth feel. The tea leaves may be re steeped a couple of times more with excellent results. 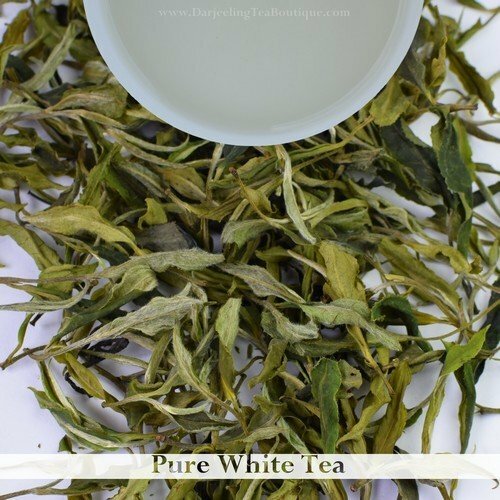 A perfect tea for those who want ore health benefits as well as for those seeking delicious flavor from a white tea.